To help demystify some louvre elements we thought we would explain some of the common parts you will see on a louvre drawing and what they do. Aluminium car park screening louvres have been used to screen the extensive car park area underneath the Premier Inn, at Gatwick Airport. To ensure adequate ventilation was provided, whilst keeping the rain out of the building a weather resistant ventilation solution was required. Discover how to calculate louvre pressure drop and why it's an important factor to consider at the design or specification stage. We take you through a brief introduction to louvre performance testing, the results and what they mean. Discover how to specify louvres correctly for your building, why free area isn't the best method and how taking into account the building's surroundings is beneficial. Learn more about the bespoke ventilation & pressure relief package providing essential airflow and safety to the new Beckton Waste to Energy plant. Discover the custom performance louvre solution providing essential airflow to the iconic one world trade center building in New York. Comparing architectural louvre models can be tricky we highlight the key criteria to look at and what the performance data you're given actually means. Architectural louvre blades have undergone quite the transformation since their invention discover how they've changed for the better and what these changes mean. Discover how CS has managed to achieve triple bank architectural louvre performance in a more compact, spatially efficient package than ever before. Exploring the hidden costs behind economy architectural louvres, drawing on CS' 60 years of experience in performance louvres we show you what can go wrong. We discuss what architectural louvres are, why they are used on buildings and the different types available. Buying a performance louvre for your project is complicated, so you need to make sure you ask the right questions at the time of purchase, here are 5 we recommend. Discover the Performance Louvre system protecting the priceless infrastructure and mission-critical information at one of Australia's leading data centres. Learn why not all Class A Performance louvres can be considered equal, what BS EN 13030:2001 involves, plus louvre specification considerations. 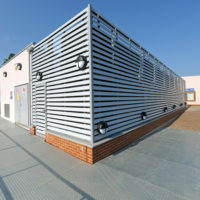 Adding to its portfolio of architectural solutions, CS UK Ltd has launched a range of louvres to provide architects and engineers with an aesthetic screening solution, which allows maximum airflow and provides a highly efficient rain defence. Did you know that specifying building louvres on free area alone can cause problems? We explain how you should be specifying louvres and why free area alone isn't a good idea. Architectural louvres are ventilation products that allow air to pass through then whilst keeping out unwanted elements such as water, dirt and debris.